Ici, enfin, je repose | One quality, the finest. 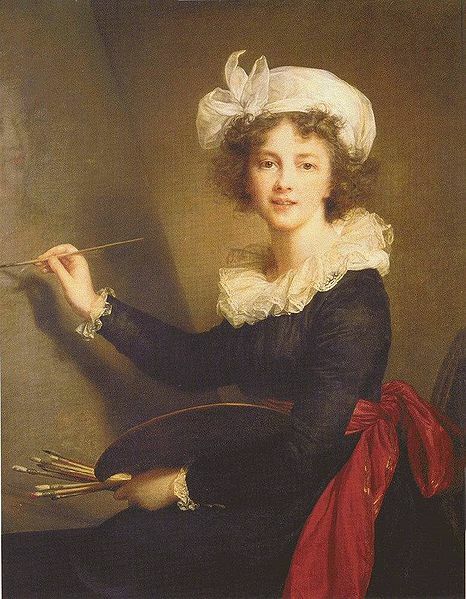 One of my favorite painters, Élisabeth-Louise Vigée Le Brun, was born today, April 16 in 1755. She was born a stone’s throw from the Louvre in the Palais Royale. Her father was a portrait artist in pastels. He taught Élisabeth what he knew, but her talent soon surpassed that of her teacher. The painting above is her self-portrait. Her father died when she was just fourteen, and she undertook to support her entire family by her brush. She also excelled in portraiture, but she preferred oils to pastels. She soon attracted the attention of the court, particularly Marie-Antoinette, for whom she painted thirty portraits. Any image you have in your head of the most famous French Queen is most likely a painting by Vigée Le Brun. On 25 October 1783, she was made a member of the Académie, the governing body of French artists, at the urging of Louis XVI, but certainly based on her own talent. She was probably the first professional woman artist – a complete trailblazer. Her association with the aristocracy made her a prime target during the French Revolution. She fled France and lived in exile throughout Europe, continuing to paint portraits of the international aristocracy. Once the Terror was over, she returned to France and continued to paint. She found the new aristocracy of Napoleon and his family pretentious and lacking in basic courtesy, such as punctuality. 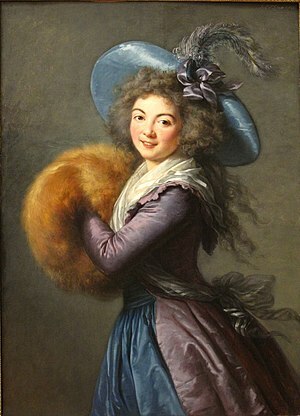 Vigée Le Brun died at the age of 86 in 1842. She left a body of work of 660 portraits and 200 landscapes that hang in every major world museum, including the Louvre. No wonder her epitaph read Ici, enfin, je repose (E-cee, onfan, juh ruhpohz), which means “Here, finally, I rest.” She’d earned it. This entry was posted in Art, People and tagged Élisabeth-Louise Vigée Le Brun, French artist, French Revolution, ici enfin je repose, Louvre, Marie Antoinette, Musée du Louvre. Bookmark the permalink. Pingback: Donner du coeur au ventre | One quality, the finest. Pingback: Ce n’est pas un cadeau | One quality, the finest. Pingback: En plein air | One quality, the finest. Pingback: Bimbeloterie | One quality, the finest. Pingback: On n’a rien sans rien | One quality, the finest. Pingback: La lecture | One quality, the finest. Pingback: Qui a réussi tout seul | One quality, the finest. Pingback: Five on Friday 4 | One quality, the finest.